Stroll through Jack Griffin's sweet-smelling indoor garden in South Philadelphia and you can't help but sample the wares: juicy strawberries – red all the way through and sugary sweet. Maybe the best basil you've ever tasted – so fresh a plucked plant lasts more than a week unrefrigerated in water, and so clean it doesn't need washing. Huge heads of spinach and kale that become popular sale items at DiBruno's Chestnut Street branch, at Northern Liberties' Penn Herb Co., and in the Essene organic market in Queen Village. Plus a wild assortment of exotic microgreens, one with a tangy bite like wasabi, another so oily it's being developed as biofuel for jet airplanes, in cahoots with Philly-based bioenergy firm SG Preston, JetBlue, and Qantas Airlines. The plants are hidden away in a former factory, a couple flights up. There's a fantasy-like aura to Metropolis Farms, as this self-made Clark Kent of hydroponic vertical gardens (with multiple levels) has named his R&D lab and equipment-manufacturing facility. A sign on the wall declares Metropolis the nation's first grown-in-water food producer that's "certified vegan," meaning no pesticides, herbicides or animal by-products are used. And that's nothing, says the Juniata Park-spawned Griffin. Wait till you see the full-scale, vertical-grow facility he's building 500 yards away on an upper floor of the S&S Foods/Betty Inc. warehouse, owned by the farm-partnering Sved family. The Columbus Boulevard structure is topped by and runs on one of the city's largest array of solar panels. "By growing on four stacked levels across 100,000 square feet, we're going to be able to equal the output of a 660-acre farm," Griffin said. And deliver a predictable, healthy new harvest maybe eight times a year. instead of just the three or four growth cycles of outdoor farms. Thank the new production efficiencies that Griffin and his design partners are bringing to bear to the grow-anywhere, indoor agriculture movement. 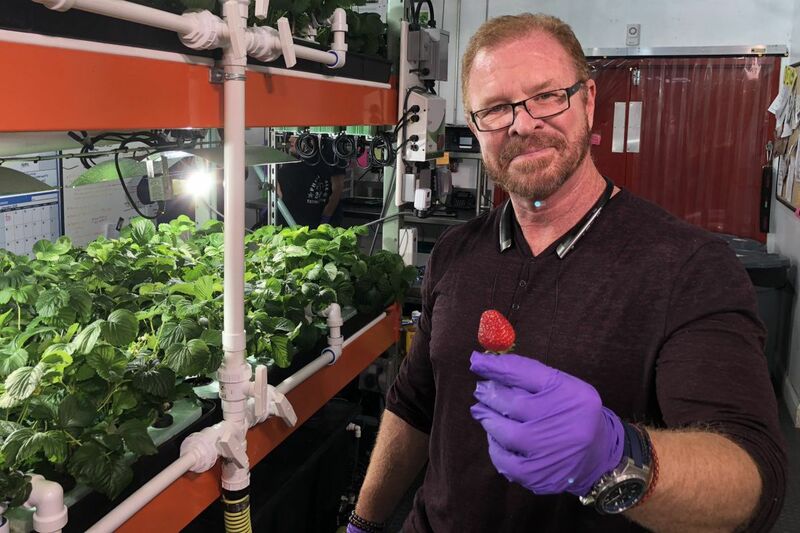 These range from the special water-chilling-and-churning apparatus to robotic lights "that shift like the sun" over the plants and use a new "ganged" light bulb driver, the "secret sauce" that cuts Metropolis' energy consumption by 62 percent, Griffin claims. A believer "in growing science, not soil magic," Griffin, 54, employs a four-step filtering process to purify the Schuylkill punch feeding the plants. He also uses advanced soil-testing technology to replicate and then infuse said Philly water with all the minerals needed to grow a nutritious crop, without the dangers of food poisoning that come with using manure, he notes. But he's aware that this better-living-through-chemistry strategy has detractors in the mainstream organic gardening community. Like WHYY-FM You Bet Your Garden host and former Organic Gardening magazine editor Mike McGrath, who fears it's getting "dangerously close to the vision" of the venerable sci-fi film Soylent Green, and its very icky way to make food. McGrath doubts whether hydroponics can supply all the nutrients of rich soil. He also doesn't like the use of PVC pipe in Griffin's water-routing and pooling system, as McGrath fears it could leach chemicals into the water. Griffin says "food-safe" PVC pipe is dangerous only when it's heated and "tests perfectly safe with the chilled water we're putting through it." In his system, the pipes are "pieced together without glue" to avoid another threat for contamination. His company, which has 12 employees, most of them independent contractors, had about $1 million in sales this year and has already booked $30 million in orders for his equipment for next year, driven largely by the growing marijuana industry. "With our patented connectors, we can ship a system flat, assemble it in days, not months, then easily take it apart in a half-hour for periodic cleaning in an industrial dishwashing machine," he said. Oh, and to suit the farm-partnering Sved clan's Orthodox Jewish practices, the nutritious end-products in their hyper-sized Columbus Boulevard setup will all be grown in "certified kosher" fashion, which demands the facility be "100 percent bug-free." As persuasive as he is fastidious, trading on a skill set in physics and economics and as a former Wall Street merchant banker, Griffin characterizes himself as a "socially responsible capitalist" who thinks local and wants to grow local. But Griffin is also making "quite a name for himself nationally," noted Greenhouse Management magazine editor Patrick Williams, with cover stories last spring in GM's Produce Grower quarterly and the new winter issue of the Pennsylvania Horticultural Society's Grow magazine. And he's lately been scoring significant success as founder of the National Urban Farmers Association in lobbying governmental agencies to finally reverse state and national farm-funding and labeling policies, rules that have long discriminated against urban growers and hydroponics. The entrepreneur says he's getting 25 requests a day to supply prefabricated indoor vertical gardens for others. "Some of the requests are unrealistic, a lot are really large," he said. Driving the interest? "Seven out of 10 people that have been working in the farm fields are illegal immigrants, so we have a major agricultural crisis underway. The other big interest is coming from marijuana growers, as more and more states make recreational pot legal. New Jersey's new governor, Phil Murphy, has made that a priority for his first hundred days in office. And with a crop selling for $2,500 a pound, vs. $2 a pound for lettuce, putting up a pesticide-free grow facility that costs $3 million is nothing to the marijuana industry. Honestly, they've been fueling a lot of our research." Get Griffin going and he can go on for hours about his cause. "I'm a pathologically stubborn guy," he joked. "Tell me there's something I can't do – like grow flowering plants – and I'll grow giant sunflowers. Tell me I can only grow garden greens, and I'll give you corn and cherry tomatoes." "The biggest problem with food today is that it's 3,000 miles away," he argues. "We don't grow food for people anymore, we grow it for trucks, to survive a cross-country trip. Tomatoes ride in a truck surrounded by ethylene gas that turns them red but not really ripe. That's why most taste like a bad rice cake. Whether it's from us or another local farmer, you'll always get better food that's grown here. It will taste better and have more nutrition. And even if it costs a little more to grow inside here than in California, we're saving the 35 percent of food pricing that's trucking and logistics. Wouldn't we rather keep all that money here? Am I really losing money by paying people a living wage, being loyal to the city? Wouldn't it be better to take over abandoned warehouses in North Philadelphia and turn them into indoor vertical gardens, employing neighborhood people, disadvantaged veterans? We can also put the gardens inside Philadelphia prisons" (at least one already has an outdoor orchard) "and teach the inmates a trade that will serve them well when they get out, end the cycle of recidivism." Metropolis Farms' grow-local strategy has won over the likes of "the mayor, the city controller, City Council, and members of Congress," noted Jeff Hornstein, director of financial and policy analysis in the City Controller's Office. And Griffin has charmed "large institutions like Penn and Drexel and Jefferson, and their supply-chain intermediaries – The Compass Group, Sodexo, and Aramark – to line up and say they'll buy food from Metropolis." So Jack Griffin has become the "poster boy" for the Anchor Procurement Initiative that's been jointly developing by the City Controller's Office and the Commerce Department, but "will soon spinning off to another appropriate organization," said Hornstein. "We've identified $5.3 billion in annual spending from 35 large area institutions that could be shifted locally. Metropolis Farms will be a key player in this."